Knights of Creativity Spirit & Ale: "The Great Soul"
It's difficult to write about "Spirit" and "Unity Through Diversity" without quoting Mahatma Gandhi. "An eye for an eye makes the world blind." 60 years ago today, Mohandas Karamchand Gandhi, the political and spiritual leader of the Indian independence movement, is assassinated in New Delhi by a Hindu fanatic. 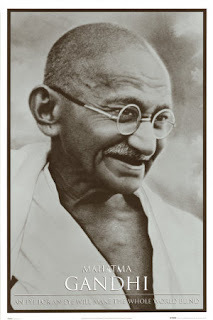 Gandhi organized his first campaign of satyagraha, or mass civil disobedience. After seven years of protest, he negotiated a compromise agreement with the South African government (regarding the plight of Indians in South Africa). There is so much to this man and his life that I don't pretend to know or understand. But, he was like a Knight for justice in this world through nonviolence. Long story short, Gandhi's persuasive methods of civil disobedience influenced leaders of civil rights movements around the world, especially Martin Luther King Jr. in the United States. Once asked what he thought of Western civilization: "I think it would be a good idea." I don't think that Gandhi would have wanted to be a Knight; however, I believe that this Knight would love to be a little bit of Gandhi. Well written Sir Bowie! Gandhi was indeed a great revolutionary. The closest thing to Jesus since his time. I believe that Gandhi would have fully embraced the concept of the Knights of Moleskine, Spirit and Ale. He definatly could handle the Spirit part. Yes, to be non-violent and pursue our believes and strategies in life is a true excercise in Unity through Diversity. Now, I must wipe my sword off and continue my meditation!